Can Trump's pick to lead HHS navigate the churning political waters of healthcare? Former pharmaceutical executive Alex Azar will face daunting management and policy challenges if he's confirmed as President Donald Trump's nominee to lead HHS. Trump on Monday announced Azar as his choice to succeed Dr. Tom Price, who resigned in September following reports of his extensive use of government and charter air travel. Azar "will be a star for better healthcare and lower drug prices!" Trump tweeted. Azar would inherit a huge, sprawling agency currently torn by political and policy divisions in the wake of Price's leadership. He will have to make key decisions to avoid further disruption in the individual health insurance market, while navigating around fierce partisan schisms. In addition, he will have to decide how much leeway to give states to make big changes in their Medicaid expansion programs. And he'll face pressure to address rising prescription drug costs. Azar formerly headed pharmaceutical giant Eli Lilly & Co.'s U.S. division. Before that, he served as HHS general counsel and deputy secretary during the George W. Bush administration. During that stint, he received praise for his management competence. He did not have a healthcare background prior to his HHS work. "I worked with Alex every day for the whole time I was at the CMS, and he's a very nice human being and a smart lawyer," said Tom Scully, who served as CMS administrator in the Bush administration. "He's a great listener, he's smart enough to know what he doesn't know," added Scully, now a general partner with private equity firm Welsh, Carson, Anderson & Stowe. "He won't come in with strong policy views. He will talk to people in the department and on the Hill and see what they think." Andy Slavitt, CMS administrator under the Obama administration, offered cautious praise for Azar as the choice to head the $1.15 trillion, 80,000-employee agency that oversees the CMS, the Food and Drug Administration, the National Institutes of Health, and the Centers for Disease Control and Prevention. "I have reason to hope he would make a good HHS secretary," Slavitt said in a written statement. "He ... has real-world experience enough to be pragmatic, and will hopefully avoid repeating the mistakes of his predecessor in over-politicizing Americans' access to healthcare." "It's good to have somebody who has the perspective of the industry that plays the most important part of drug development," said Dr. David Spigel, chief scientific officer and director of the lung cancer research program at HCA's Sarah Cannon Research Institute. Still, Azar has been a sharp critic of the Affordable Care Act, saying in May that the ACA is "fundamentally broken" and "circling the drain." In June, he envisioned the Trump administration shifting the ACA in a more conservative direction even without repeal and replacement of the law. He previously has opposed ideas for reducing prescription drug prices such as purchasing drugs from other countries where prices are lower. Azar went to work for Lilly in 2007 as senior vice president of corporate affairs and communications, and later became chief of Lilly's U.S. operations, a position he held until this past January. He also served on the board of BIO, which represents biotechnology companies. In his confirmation hearings, Senate Democrats are expected to probe Azar's close ties to the drug industry and whether he has the independence to take strong steps to curb drug prices, an issue on which Trump has urged action. They also are likely to question him on his approach to implementing the ACA. "This confirmation process will be a referendum on the Trump administration's repeated efforts to sabotage our healthcare system and raise premiums on millions of Americans," Senate Democratic leader Chuck Schumer of New York said in a written statement on Azar's nomination. "It's time to turn over a new leaf at HHS." Azar would take charge of an agency that is still roiled by investigations into Price's air travel, with senior political appointees reportedly divided into different political factions. In addition, many career staff are concerned about Trump administration moves to roll back ACA coverage and impose tougher conditions on Medicaid eligibility for low-income adults, said Tim Gronniger, a CMS deputy chief of staff in the Obama administration who's now senior vice president of strategy at Caravan Health. Azar will have to decide whether to continue the Obama administration's aggressive push for much broader use of value-based payment programs in Medicare. Price had slowed HHS implementation of value-based payment, especially mandatory programs. 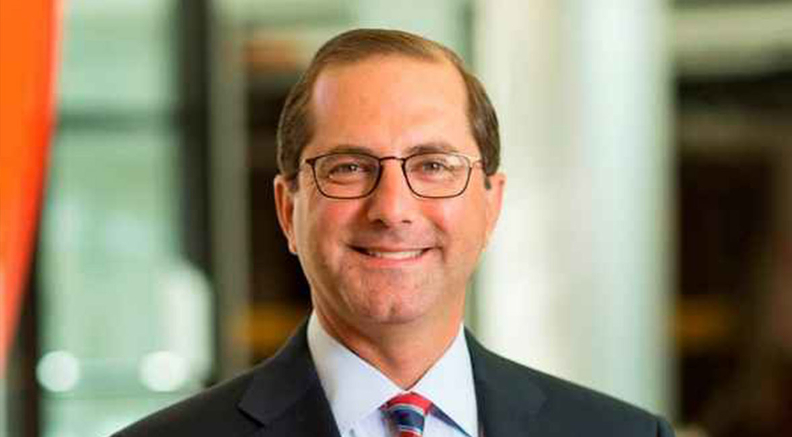 Observers predict Azar will be less openly ideological than Price, a former orthopedic surgeon who vocally advocated less regulation of healthcare businesses and medical practices. "I would expect him to be less out there opining on a regular basis," Scully said. "He's a lawyer, he's not going to be out there winging it. It's not his style. He's a nice, honest, pleasant guy." Gronniger agreed. "I think it's great he comes in without really strong public policy positions," he said. "That was a huge weakness for Price." One management issue Azar would quickly face is how to deal with Price's ambitious Reimagine HHS initiative to streamline the department's operations. That plan accompanied the White House budget proposal to slash the HHS' budget for 2018 by 18%, a move congressional Republicans do not support. Azar is considered a skilled manager, but he'll have his hands full administering the huge agency and coordinating efforts with CMS Administrator Seema Verma. "As much or more than what he thinks about policy, the manager part is more important than anything else," Gronniger said. "It's a hard place to run, and he'll have to work through a lot of tensions."